These Pet Rescue level 335 cheats and tips will help you beat level 335 of Pet Rescue. 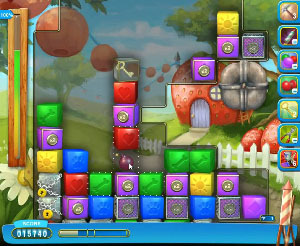 The objective of Pet Rescue level 335 is to clear 100% of the blocks and get 23,000 points. The first and most dangerous obstacle you’ll encounter in Pet Rescue Saga level 335 is the virus. These nasty bugs start multiplying on the right side of the board after the first turn, and they won’t stop until you eliminate them all. Since you have a lot of points to collect, you don’t want to waste blocks on viruses. Group them all together and collect them at your earliest opportunity. This will simplify things a lot later. Sometimes you’ll notice that one column or another is clogged with alternating blocks you can’t match. The best solution for these columns is just to remove them with extreme prejudice. You’ll get plenty of directional blasters to use in this level, so look out for trouble columns and blast them when you’re sure you can’t make them play nicely with other blocks. Your column blaster will prove to be a valuable weapon late in the game. You can use it once on anything you like, but after it charges for the second time, you might not get another chance to use it. When you’re on the bottom of the board, look for blocks you’re extremely unlikely to match normally. If there’s only two other blocks of its kind on the other end of the board, a block is a good contender for column-blasting.